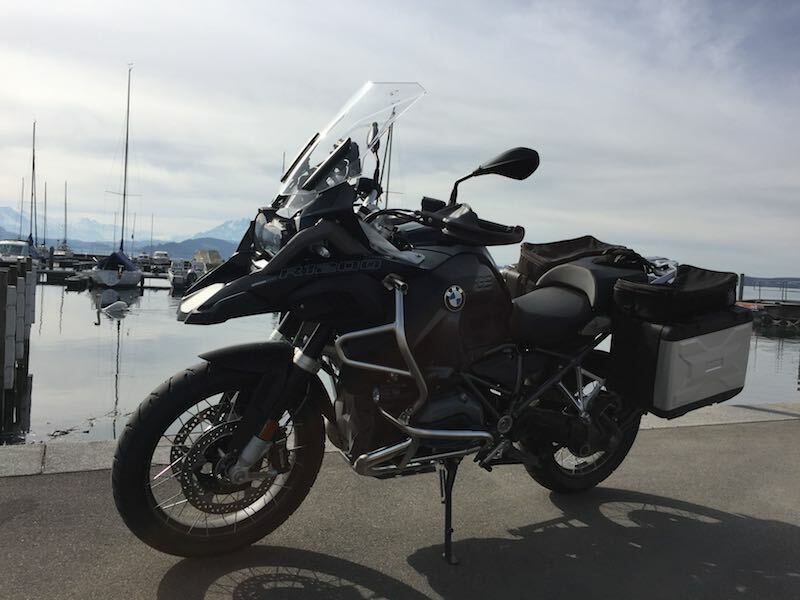 Last spring, I replaced my BMW R1200GS ABS with a new BMW R1200GS Adventure Triple Black from the same stable. The reason being that the original GS was a little tall in the saddle and it was also four years old. The 2017 Triple Black Adventure was an easy choice, as it offered the low chassis and extra fuel range that I decided were priorities during my four enjoyable years with the first one. As the bikes are essentially the same, I knew that it was an easy transition in terms of its ride and handling, and any bits I wanted to reuse could be transferred without issue. 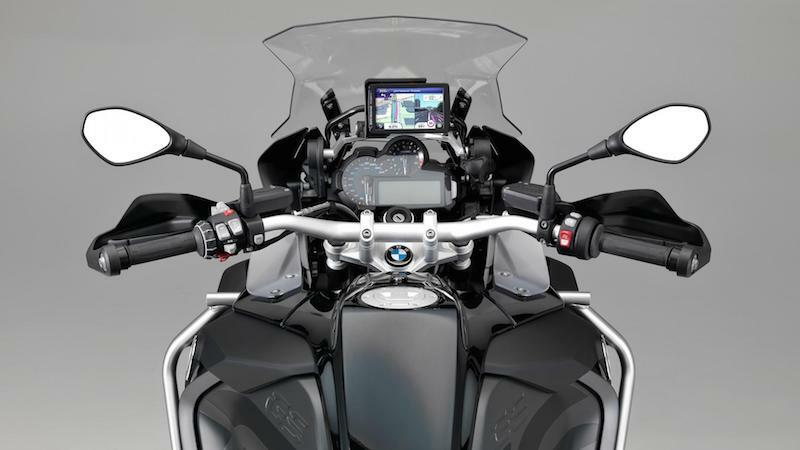 The decision was based on test rides of the S1000XR and the F800GS. I found the S1000XR to be too ‘buzzy’, high in the seat and uncomfortable, and was sad because the power delivery is very good. 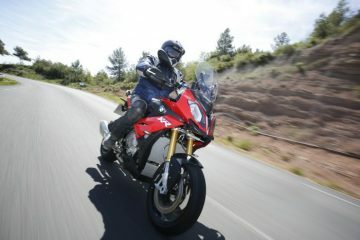 I also prefer to sit lower in the saddle rather than perched on the top of the bike, which the R1200GS allows. After testing the F800GS, I missed the “lazy” power delivery and balance of the big GS. This was backed-up by a friend of mine who has the F800 and is now planning to get the R1200GS. For the new bike, my criteria were now clear in terms of getting the Triple Black Adventure. I wanted to be able to ride for more than 250 miles without having to stop for fuel, plus I wanted to continue to enjoy the excellent ride and handling of the big GS whilst being able to balance the bike better when stationary. 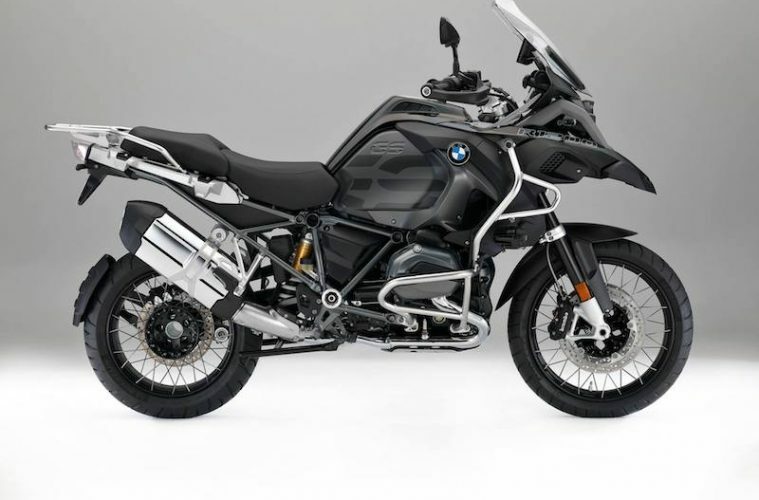 During the four years with the BMW R1200GS ABS, I had several moments when I had to try quite hard on uneven or loose surfaces to keep the bike upright, and so I was attracted to the low chassis in the new bike. During this time, I also made several all-day trips into the French Alps and only experienced any stress when searching for petrol in outlying villages or at lunchtime when everywhere is closed. There’s no avoiding the fact that the BMW R1200GS is a big machine. This is the first thing that my friends and family say when they see it, and I spend time trying to convince them how well balanced and easy to ride it is. This also gives me the opportunity to act the ‘super hero’ and make out that I am just more skilled. The simple fact is that I am no better rider than anyone else, the BMW R1200GS is just very forgiving, and will handle any situations that I can throw at it. With the Adventure model, I have found no difference in balance when fully fuelled with 30 litres of petrol compared to my previous GS (19-litre fuel tank). 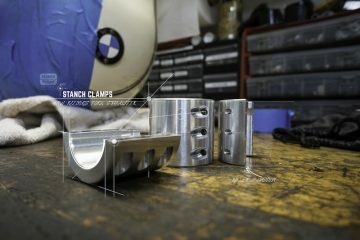 That’s a neat trick BMW! I try to avoid motorway travel, but motorways exist as a necessary evil to skip the bits of countries that you don’t want to visit on the way there as well as home. The big GS is perfect for motorways and provides a stable and comfortable platform plus some toys to reduce the boredom/stress (a bit anyway). The BMW R1200GS Adventure Triple Black is also good for around two weeks away with your nearest and dearest. The panniers are spacious enough for a variety of clothing for a summer trip and the distance between the pillion seat and the rear foot-pegs means that any leg amputation work is not necessary for a comfortable trip. This means that the pillion rider can relax, stretch and not feel the need to hang-on even when heading down the Stelvio Pass from the junction with the lesser known Umbrail Pass. The engine modes (Dynamic, Road, Rain, Enduro), which can be dialled-in on the move, allow you to change the engine power, braking and traction control to try and match the prevailing weather and road conditions. 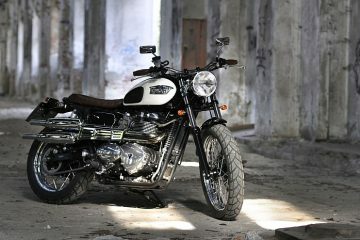 On the newer models, there is the addition of clutch-less up and down shift, plus even smarter ABS. Whilst clutchless up and down shift takes a little time to get used to, it is undoubtedly fun when either blasting away from traffic lights or doing quick down-shifts before entering switch-backs. The clutchless up and down shift is sold as being quicker than a human being and I am sure that computer-controlled features undoubtedly are. At the same time, I have always found the clutch on the big GS to be very light and still forget that I don’t have to use it every time. 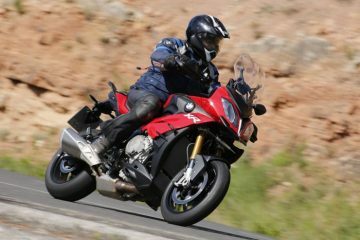 The R1200GS is not a sports bike and it would obviously struggle to keep-up with the likes of a Fireblade, R1 or S1000RR in the real twisty stuff, but then that’s not the point of the big GS as a ‘go anywhere’ continental tourer. In terms of power delivery, the bike is very capable, and the new liquid cooled (LC) engines seem to be more responsive to the throttle. It doesn’t matter if you are ‘blatting’ around alpine roads or taking your partner (plus luggage) on a tour of northern Italy, the big GS copes very well. In terms of handling, the BMW R1200GS Adventure Triple Black is very forgiving. Somehow, the weight of the bike seems to disappear as soon as the wheels get turning and it feels like a stable platform whether on a straight road or around the bendy stuff. That low-down weight makes it easy to get into a rhythm on switch-backs making each turn a pleasure that you want to keep going all day. In the end, it seems to be the fuel range that makes you want to stop rather than fatigue. The adjustable seat height, standard and low chassis plus ESA allows a guy like me with a 29” inside leg to hold the big GS with confidence and with feet flat on the ground. This is especially useful for two-up riding complete with full luggage etc. and means that the bike does not feel quite so big for those holiday trips. The roads tyres that were factory fitted on my R1200 GS ABS were Metzeler Tourance and they provided a confident ride on all roads and a variety of weather conditions. I stuck with them for the four years that I kept that bike without any issues. Since swapping to the Triple Black Adventure, I have been disappointed with the factory fit Michelins, as they seem to be sensitive to those black bitumen strips which proliferate on mountain switch-backs and are a favourite method of repairing cracks and covering joints in roads. I will investigate Metzelers as soon as the Michelins are up for replacement. The front and rear brakes are linked to the front brake lever with the foot brake lever only activating the rear brake for hill starts, etc. The ABS and traction control package, which is linked to the driving modes, is great and I am quite happy to have it without testing these features to their limit. I started-off with the R1200GS ABS in 2013 complete with the BMW Vario panniers and BMW extendable tank-bag fitted as standard. These panniers are excellent, and with their standard inner bags have been used extensively for near five years now. The inner bags work just as well inside the panniers for holidays as they do as a laptop case for the daily commute into Zurich (on the bike or even the train). 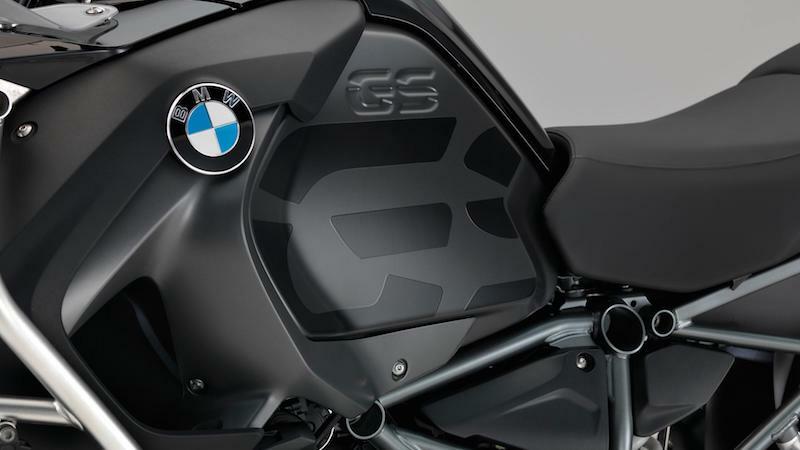 The panniers come into their own even more when you find-out that they fit the BMW R1200GS Adventure Triple Black too! This may seem a bit strange, as having the metal cases is the Adventure look, but since taking this decision, I have encountered a few other R1200GS Adventure owners who have done the same. I also have bags from Touratech that fit on the top of the Vario panniers and are good for about six bottles of wine. The BMW luggage fits the bike very well and the Vario panniers have plenty of space, even with the inner bags fitted. Both the panniers and the bags are expandable, so you can put stuff both in and around the inner bags. Even with the inner bags expanded, there is space ‘behind’ for maps and other small accessories in the contours of the panniers. The luggage is roughly the same price as aftermarket alternatives and I rarely see other big GSs with anything other than BMW luggage fitted. My only luggage complaint is with the tank-bag for the R1200GS ABS which reflected the sun into my eyes when riding. Just bad luck I guess, but I was not sorry when it was clear that a tank-bag would not fit the Adventure (it has a little compartment on the top of the tank for money/keys/credit cards instead). 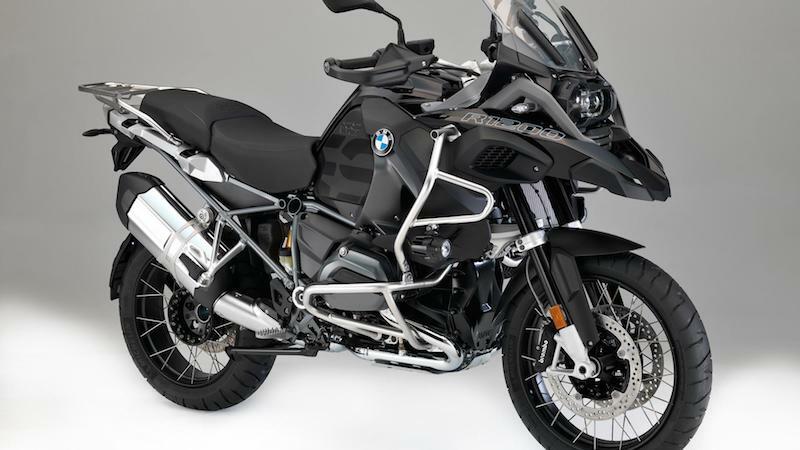 This article is focussed on the BMW R1200GS Adventure Triple Black as a touring machine, but we cannot forget its heritage. It continues to be used by celebrities to cross continents as well as featuring in classic desert races, etc. I am no off-road rider, but I take comfort from the fact that I can pretty much go on any marked road or dusty trail to cross mountains and counties near me and see some spectacular sites. The R1200GS provides the confidence and surety of footing to allow you to book any type of accommodation, whether it’s an Agriturismo at the end of a gravel farm track, a tent in a muddy campsite or a five-star hotel. I recently safely navigated a forest track on a mountain in France that my GPS mistook for a white road. The big GS and its road tyres were even fine when I had to ford a mountain stream that cut across the same forest track. When I have more time, I shall plan for proper off-road trips. 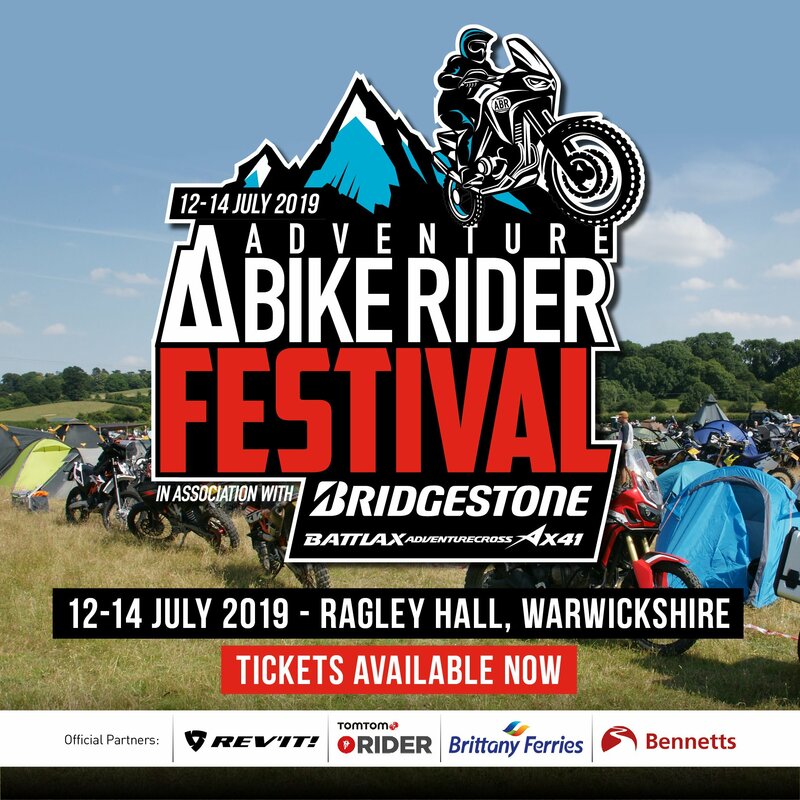 I know that I will have to update the standard tyres and suspension on the big GS, however the wide available range of upgrades, specialist shops, safety equipment and accessories will support this. The core big GS will still be the same, it’ll just need a few adjustments. Servicing is an annual event for me, and whilst expensive in Switzerland, has been on the whole without issue. The only problems I had were when the mechanic put exactly the right amount of engine oil in and the low oil light came on intermittently. The other problem was with a soft back brake which, still to this day, is undiagnosed. In the end, I added the GS Adventure brake pedal to my GS ABS to give me that extra bit of leverage. In the early days of the LC models, the switch gear had to be replaced and BMW had problems with brake pad material – but both of these issues were solved free of charge. The screen on my GS ABS split, but as this was also a known error, it was also replaced without argument. 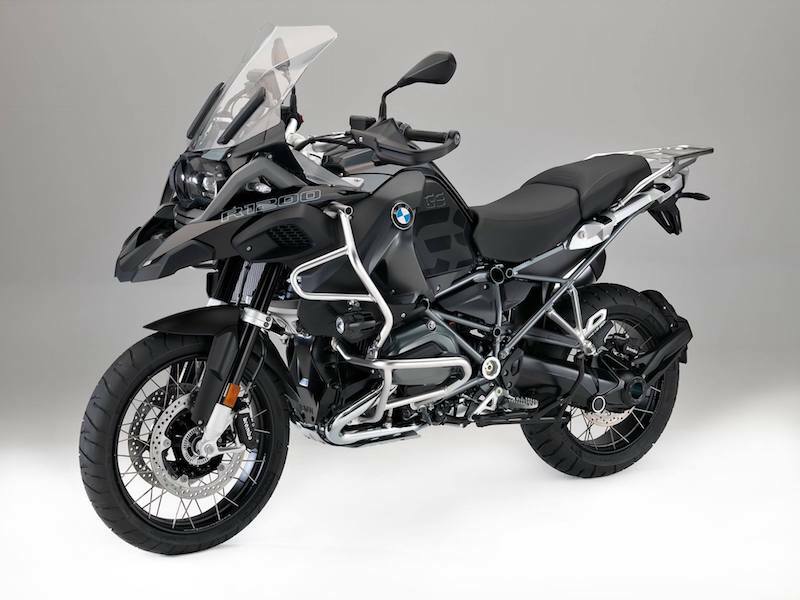 Recently, I have had the recall completed on my BMW R1200GS Adventure Triple Black regarding the problem with the top of the front forks. This work was completed while I waited and enjoyed a few cups of free coffee in the bike shop. Cleaning the GS is easy as most of the bike is accessible and the metal and plastic parts are quite ‘lumpy’ in shape. There’s not much else to do except add petrol, replace tyres (usually annually) and check tyre pressures from time to time. As mentioned, the LC models don’t suffer from oil consumption, so I stopped looking after a bit. Tyre values are harder to access on the spoked wheels standard with the GS Adventure, which means that you have to find a hose with a flexible pipe – which are quite rare in Switzerland. In terms of looks, the new water-cooled models look sharper and have the distinctive LED light strip and headlight arrangement to set them apart. The adjustable windscreen tends to be adjusted just once and that’s it, but the overall wind deflection has obviously been worked-on in the wind-tunnel improving the styling at the front of the bike too. 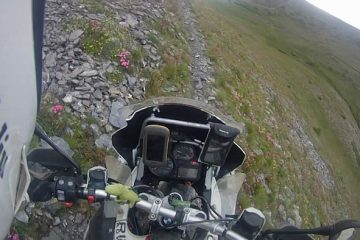 I think that the BMW R1200GS Adventure is the best bike for European travel and especially for Alpine passes. 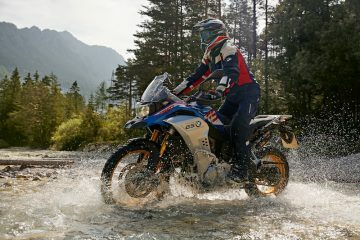 I have tested both the air cooled R1200GS ABS as well as the equivalent Adventure, I now know that the LC replacements are better for me than their older air-cooled cousins. As a bonus, I have never had problems with oil consumption in 5 years of owning the LC models. I have heard that some air-cooled models are prone to this. I like the package of toys that the LC models come with, and as a long-standing Japanese bike rider, having a ‘normal’ indicator switch is a great relief. The control wheel, which is used to operate the integrated BMW (Garmin) GPS, is good, the cruise control is very useful in relieving some CTS symptoms on long journeys, automatic headlight with the supplemental front spotlights is also a very nice touch. The jury for me is still out on the keyless ride, as it is unnecessary and is a potential point of failure. I recently discovered the curvy roads mode in my GPS. Basically, find an interesting area with twisty roads, mountains and great scenery and ride to one end of it. Pick a point at the other end of the target area, select curvy roads mode on the GPS and start the navigation. It’s a bit of a magical mystery tour but great fun – the only problem being that the GPS can take its role a bit too literally and you end-up going through a few farmyards on the way. 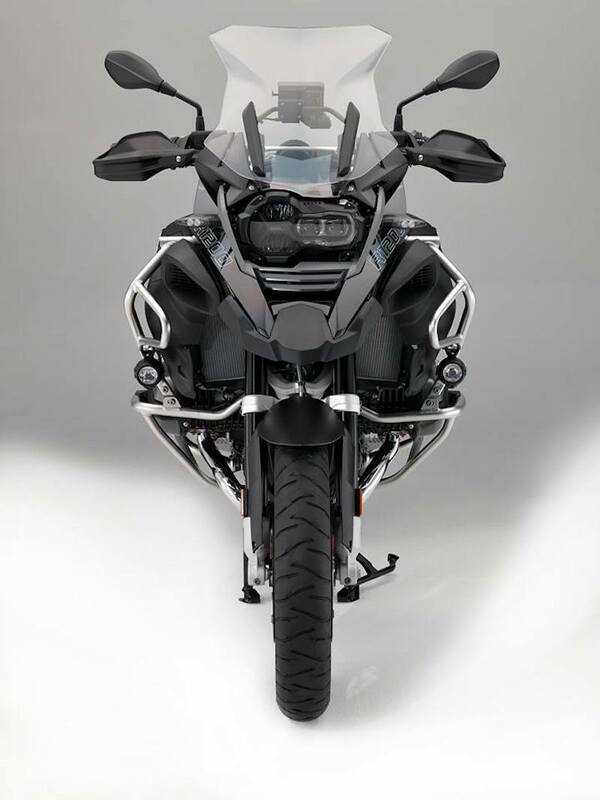 The BMW R1200GS Adventure Triple Black is ubiquitous in and around Europe. The simple reason being, it’s one of the best bikes for the job and for a range of roads (boring motorways to alpine switch-backs) and even some light off-road work. It’s easy to ride, not as big as it looks and very comfortable for 10-hour days in the saddle. It still surprises me what the big GS can do and how BMW continue to improve the design of the boxer configuration bike with each iteration. High Point: Riding 10 hour days in northern Italy and the French Alps with no fatigue and total joy about life. Low Point: Just niggles with the BMW Navigator 4 (and 5) regarding the BlueTooth connectivity. This equipment is not up to the quality mark that I have come to expect from BMW. Chris Cogdell is a freelance Senior IT Business Analyst working in Zurich. He has been riding bikes (originally Japanese sports bikes) for more years than he cares to remember and fell in love with the Alps on his first trip to the Elephant Rally in 1980. His main stomping grounds are the French and Swiss Alps, but as anywhere in Europe is reachable from Switzerland, the list of places is forever growing and plans are being hatched. He came very late to the BMW R1200GS, resisting the move due to the fact that he doesn't like "following the crowd". That resistance has been well and truly defeated.